61420	 WON	 1604 1606	 WHITE	 K.Fukumoto	 6821-E 1128 01/15/07	 g/25 197 2007 Martin Luther King Scholastic Chess Tour. 61476	 WON	 1606 1608	 BLACK	 J.Parish	 6827-M 1042 01/15/07	 g/25 197 2007 Martin Luther King Scholastic Chess Tour. 61589	 WON	 1610 1624	 BLACK	 S.Yee	 3664-T 1432 01/15/07	 g/25 197 2007 Martin Luther King Scholastic Chess Tour. 61645	 WON	 1624 1633	 WHITE	 L.Aipa	 3708-Y 1330 01/15/07	 g/25 197 2007 Martin Luther King Scholastic Chess Tour. 61700	 LOST	 1633 1626	 BLACK	 R.Lau	 2009-A 1987 01/15/07	 g/25 197 2007 Martin Luther King Scholastic Chess Tour. "John Iinuma is playing reasonably well. 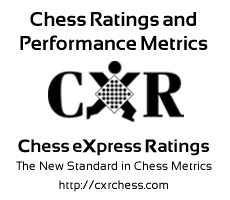 John has faced opponents with an average rating of 1363.7. He has improved by 264 points since 2004-03-06. "